I can't think of a better place than Press to explore the bounties of Napa Valley’s historic wines of the 1970s, two of which were the centerpiece of this fabulous dinner. Over the years, I have enjoyed many delicious meals at Press many times, but often the group is large and the wines are many. This small dinner was a great opportunity to follow the evolution of five gorgeous wines over several hours. 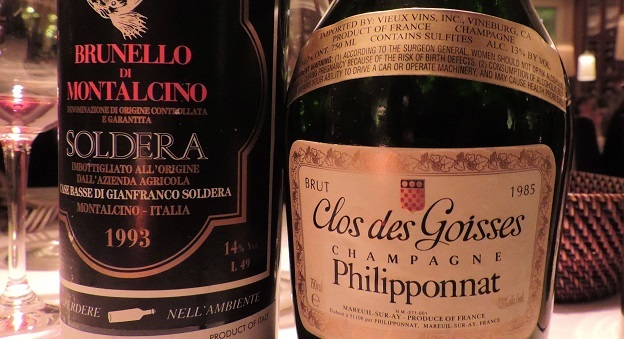 Philipponnat’s 1985 Clos des Goisses is a great way to start the night. Now close to fully mature, the 1985 is soft, open and expressive. It’s hard to see the 1985 getting better from here, but as is often the case, longevity has a lot to do with storage. Soldera’s 1993 Brunello di Montalcino Riserva is a revelation. Served blind, it comes across as an old-school Barbaresco in its mid-weight structure and sinewy tannins. But no, it is Sangiovese, and totally gorgeous. 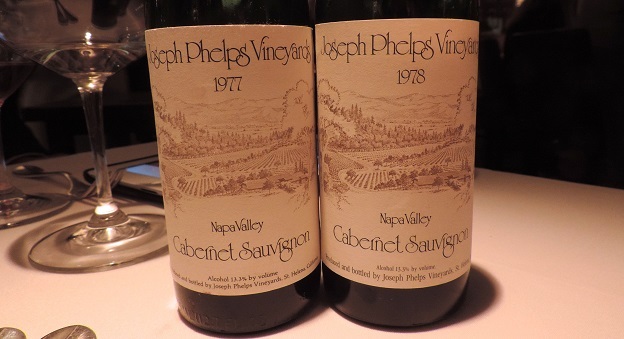 Two Joseph Phelps Cabernets from 1970s, both from impeccably stored half bottles are the main event. The 1977 Cabernet Sauvignon is fabulous. How can a nearly 50 year-old wine from half bottle be this fresh and gorgeous? What a revelation. The 1978 Cabernet Sauvignon is quite good as well, but a bit rough around the edges with slightly rustic tannin and a hint of brett. It, too, though has aged remarkably well. Giuseppe Mascarello’s 1971 Barolo is a real treat. By this time, Mascarello was making both a Monprivato and a blended Barolo. Personally, I prefer wines with a little more freshness, but the 1971 is quite pretty, especially right after opening. At this stage, though, any remaining bottles need to be finished. Press has a new Chef, Trevor Kunk, who was previously at Blue Hill in New York. There are a few new twists to the menu, but it’s hard to forego the classics. The Maine lobster and crab cake is divine. For my taste, the pork chop is a little overbrined and too seasoned, especially for these decidedly delicate, older wines. In retrospect, a more neutral meat would have been a better choice. Sides of kale and Hen of the Woods mushrooms are both impeccable. Readers visiting Napa Valley will not want to miss Press and its historic wine cellar, which is essentially a library of the very best wines that have been made in the valley going back many decades.